“The struggle is real” often rings through my head as I scramble to get dressed in the morning while feeding 2 kids, packing a gym bag, and getting out of the house on time. These chaotic moments string together to make my day…everyday. There was time in the distant past where I carefully selected each article of clothing in creation of the perfect outfit, casually strolled out the door, and managed to look (and feel) effortlessly put together. Well my friends, that ship has sailed. Me, like many young moms I know, are faced with challenge of holding onto their former fashionable selves, while living a life as a functioning mom. Finding that balance of what looks put together, not overdone, and still comfortable (and washable) can be intimidating and difficult to say the least. Who has time to style outfit after outfit in between running carpool, working (which so many Moms do), cooking, playdates, and QT with hubby? I am here to help. After living “in the weeds” for the past 3 years, I have figured out a few tricks that I am happy to share with my fellow mommas or anyone who needs Function and Fashion to collide. 1) COMFORT: This does not mean you have to wear Lululemon everyday. I know, I know, it’s sooooo comfortable, blah, blah, blah. But unless you are training for a triathlon or actually work at a gym, there is no reason to sacrifice fashion for work out clothes every day. Comfort can totally be achieved in other ways. Step up your T-shirt collection: go for a tee with an interesting silhouette or a cool print. As for bottoms, flowy summer shorts are a must for warmer months, and light weight denim is always comfy and stylish. So ditch that sports bra and worn out yoga pants and opt for comfort in real clothes. 2) MACHINE WASHABLE: Save your silks for date night. No mom needs to be worried about her toddler messing up her favorite blouse, instead she should be enjoying her time with her little one. Cotton is key. And there are countless options in this department. 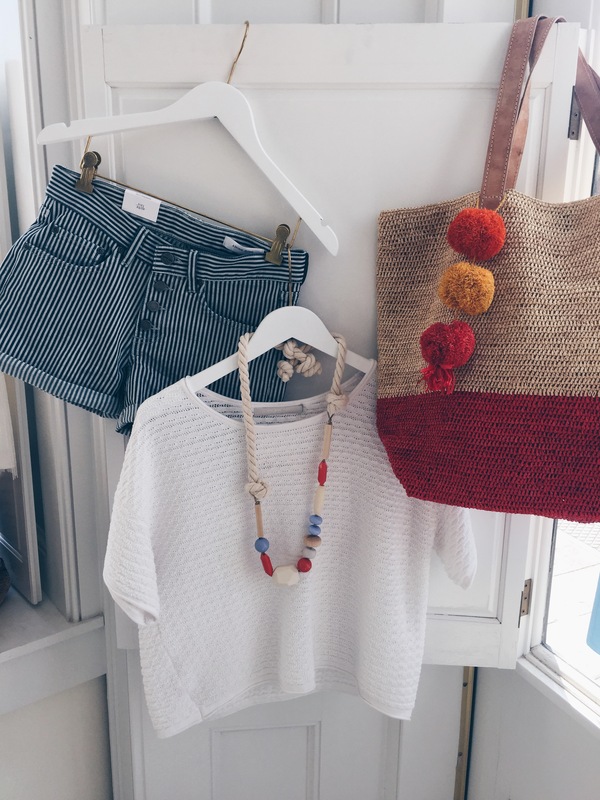 Take your basic tee and layer it with a crop top or a tank: this can create a fun effect and give personality to simple look. 3) UNIQUE ACCESSORIES: This is my favorite category to experiment with. A bright tote, a statement necklace, or some cool studs help make a look your own and give you an easy way to express your personal style without looking over done. My fave summer accessories: Killer shades and cool sneakers! Layer 2 tops to create a perfectly styled look. Pair with a relaxed neutral bottom for a soft, cool tone palette. White muscle tee with flowy pants. 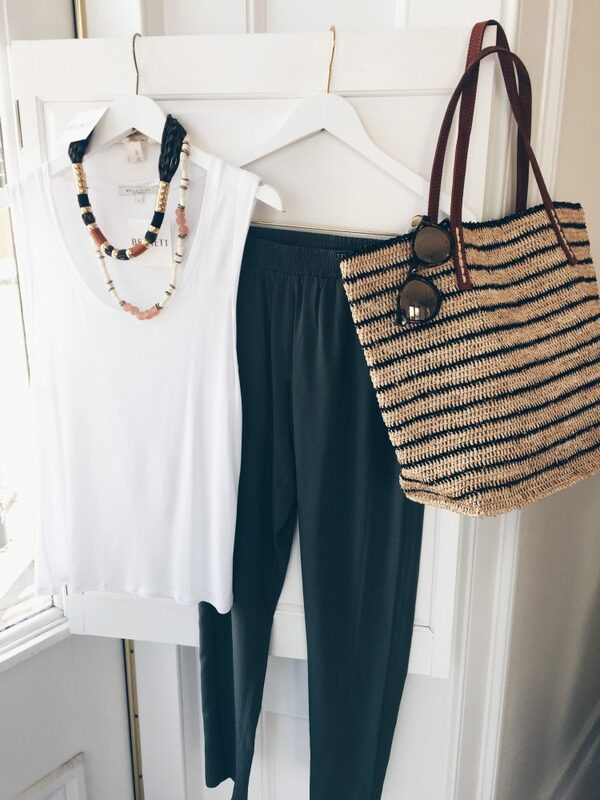 Add some statement jewelry and a large tote to complete the look. Pair a graphic tee with distressed denim. Add a pop of color with a pastel handbag. Go for a preppy look with printed shorts and a classic white top. Personalize this look with some fun jewelry and an oversized tote. A t-shirt with a cool shape is a great way to look chic and feel comfy at the same time. Ready to re-fresh your Mom style? As a proud Beckett Boutique Stylist, I am always thrilled to help anyone in need of a little fashion advice. Hope to see you soon!